This Ongoing War: A Blog: 17-Sep-06: Did He or Didn't He? Meet the Press. 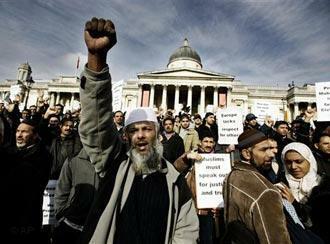 Trafalgar Square: "Soothing Moslem Rage"
One speech, followed by one press statement. And another Rashomon moment. So... did the Pope apologize? Does the Pope regret he made his comments? Or certain passages from the comments? Or the reactions, or the hurt feelings, or the offence to Islam? All of these versions of his state of mind and of his press announcement can be found in the media this morning - along with all their mutual contradictions. Pay particular attention to the headlines below - that's all that many people read. One might imagine that the reporters, editors and headline writers could agree on the correct interpretation of a simple very well-publicized speech and announcement. But like almost everything else on their pages and in their stories, there's a significant element of personal agenda, of prejudice, of ignorance and of politics. In other words, exactly what we see every day in the media's reporting of this ongoing war. The Vatican issued a statement Saturday saying that the pope was "extremely sorry" for the offence his comments had caused. Sadly, the street mobs won't, in the end, care much whether he apologized or regretted; whether he took back his words or clarified them; whether he didn't mean to offend or whether he was conducting a crusade. Mobs don't respond to press statements. They're out there on the streets, serving the ambitions and political agendas of the religious and secular leaders who pull their strings, delivering a message of hatred, intolerance and threat. A pity the editors, reporters, photographers and headline writers don't seem able to capture that insight. I think the irony is nearly overwhelming. Honestly, words nearly fail me - are these Musliim swine for real? Sorry, excuse my redundant question - to the nun they've killed and the congregations they've left homeless by burning those churches, they are all too real alright! Well, as a (formerly) non-extremist Catholic I can honestly tell you, the over-reaction to the Pope's WORDS, following on from the treatment of that Danish cartoonist, has left me feeling extremely hostile toward Muslims everywhere and hoping that my church rises up to use it's far superior firepower to wipe this ugly blemish of a religion from the face of the planet! Yes, that's right, I, a non-hostile Catholic, has become so angered by these animals that I now hope they DO bring their f***ing Jihad here and get wiped out once and for all by my God-fearing, peaceful church. It's at times like this I actually get behind the likes of George Bush as the lesser of two evils. Whilst he doesn't represent MY religion, at least he'll try and protect me and my family from these vile, unhinged barbarians. I really hope it has come to the point that Christians the world over draw a line and finally stop pandering to these filth - we never wanted violence or hostility, but they brought it. What is wrong with these people that they aren't happy until they have someone (e.g. Salman Rushtie, cartoonists, the Pope, country's and Presidents) to sentence to DEATH - they really are animals and my only regret is that the Pope even tried to open discourse with these vermin. See the rewards for trying to pander to these violent wretches? He's got them threatening to send SUICIDE bombers into his f***ing home!! Seriously like, what is this like???? I'm too angry to type. Dirty Muslim scum, dirty, dirty, dirty. The violent response of the Muslim world has proven the Pope's statement to be 100% correct. Yes, I agree, it is rediculous. They are just showing what militant Islam is really all about with their childish and barbaric outbursts. To Matt: why are you so angry at the treatment dealt out to the Catholic church? Israel has been suffering vastly greater intimidation and horror at the hands of these evil people for a long, long time. In fact, I seem to remember recently that the Pope criticized Israel for defending itself against Hezbollah so vehemently. It seems that Islam looked at the Pope in that moment and realised that he was weak. This is the predictable 'gratitude' he receives from Islam for condemning Israel. The Pope made an important point, certainly. But he then caved in and apologised, and missed an opportunity to speak the truth out loud and clearly, when the attention of the world media was listening to his words with baited breath. That he hasn't the balls to defend himself or our church against Islamists is his concern; that he publicy condemns Israel for defending its citizens' lives against islamic terror is disgusting, disgusting, disgusting. My anger is reserved for people like the Holy Father, who insist on Israeli self-sacrifice before islamic murder squads. As for the islamic murder squads, and the jihadist ideology that drives them, anger and hostility are insufficient responses. We need to destroy this ideology and all who practice it, calmly, sadly, and thoroughly. I am going to attempt to restrain myself in a similar fashion to yourself, whilst pointing out as firmly as possible to those (yourself included) that failed to absorb the Holy Father's message - HE DID NOT APOLOGISE - he said it was unfortunate that the Muslim trash (I'm paraphrasing) had picked him up incorrectly. I repeat, as I feel this is the crux of it, HE DIDN'T APOLOGISE!!! If he DOES apologise I will be firing off an email to the Vatican espousing my disappointment at his back-tracking! We owe these filth no apologies, nor anything else for that matter, they are as I have stated before, merely animals - would you apologise to your dog/cat/Ox (so the towelheads can relate)? I don't think so. However, not to veer too wildly off track, he didn't apologise, he simply pointed out that these stupid f**ks picked him up wrong. Maybe they should start using their eyes and ears instead of guns and bombs? Just a thought. As for Isreal, not my concern at the moment - the Pope being attacked is my only concern at present. Pope Benedict XVI says he is "deeply sorry" for the reaction to comments he made about Islam, adding the remarks don't reflect his own personal beliefs. "These (words) were in fact a quotation from a medieval text which do not in any way express my personal thought," Benedict told pilgrims Sunday at his summer palace outside Rome. "At this time I wish also to add that I am deeply sorry for the reactions in some countries to a few passages of my address at the University of Regensburg, which were considered offensive to the sensibility of Muslims," the pope said. So what's happened here? The Pope says "I am deeply sorry for the reactions", and the headline-writer writes "Pope 'deeply sorry' for offending". This is second-rate logic, and fourth-rate journalism. Something else: I'm not anti-Catholic but you have to be especially tone-deaf in relation to the events of history and especially of Jewish history to think kindly and fondly of popes and their effect on Jewish life (in a word: negative; in two words: appallingly hostile). But here in this Regensburg story, the speech which Pope delivered (the entirety of which I have read) is complicated, dense, literate and fairly interesting. To hear it and him condemned by semi-literate mobs literally foaming at the mouth, and then to see those mobs discussed by media analysts as if they represented some sort of opposition camp in the public philosophic debate over great ideas of our time is a sad joke. Then to read news reports like those I quoted in the blog and in the Canadian excerpt above, where the headlines tell a story that has no relation to the body of the article... that's simply another depressing indicator that large swathes of the media are in the hands of morons. None of this means I'm not angry too about the hypocrisy of some public figures, but on the whole they achieve less harm than some dyslexic (or agenda-driven) headline writers. To Matt and View From Ramot: In essence I agree with both of you. But I have a question: don't you both, as I do, wish that the Pope had made a response that was incapable of being misrepresented as an apology by the hideous media? My point remains that the Pope had an opportunity to spell things out clearly and publicly when the media were agog at what he would say, microphones trained on him, and instead he backed off, distanced himself from the contentious quote he had used, (so why use it then?) and issued what the media were able to misreport as an apology. Had Benedict been braver, the media would not have been ABLE to do this. This wasn't leadership or truth, this was a fudge. Matt - This isn't the place for us to argue. I have nothing against you or your opinions, but I would say this: for a previously 'non-hostile' catholic, you've certainly picked up a rather colourful anti-islamic vocabulary in what must be the space of three or four days, if your only worry is that people were attacking the Pope! You say that Israel is not your concern - Israel that suffers Jihadist violence week in week out - that only the attacks on the Pope's speech concern you. That's fine and you are entitled to your anger (I share it), but Israel IS my concern, so it would be fruitless for us to debate with each other - especially when we share, in any case, a common enemy. Ramot - I've just re-read your response, and I want you to know that I am totally in agreement with you. The Pope's paper in Regensburg was thoughtful, literate, challenging, and philosophical. For it to be greeted by mobs howling for vengeance is incomprehensible, for the media to virtually demand that he apologises, and to simplify his response to the anger left me too feeling bewildered. It is cultural suicide, nothing less. How long before America and Israel are the only refuge from this? Well spoken. I also hold nothing against you, and truth be told, before this hostile over-reaction to the Pope's words I thought, in actuality, very little about Muslims (or Hindu's, etc.) It wasn't my place to feel anything about them - I would have felt I didn't know enough about them to make an informed declaration on them either way. I am (sorry, was) an extremely tollerant individual. I have lived with members of a number of colours and creeds and have enjoyed lenghty debates on religion and politics with (nearly) all of them. However I feel a line was crossed when my Pope was physically threatened. So, whilst my vocabulary may seem to be heavily anti-islamic, I can honestly assure you that before this incident I was as tollerant of the Muslims as I am of the Bhuddists, Hindus, etc. I'm afraid this is no longer the case Gharqad Tree. This is as regretable, as it was avoidable. Unfortunately, in my opinion, the Muslims calling for the death of the Pope have tainted like never before my view of a whole segment of the population. Matt, I can relate strongly to what you are saying. I was never negative towards islamic culture until the Lockerbie bombing, in which I lost a good friend called Sean, a funny and decent human being, who fell several thousand feet through a winter sky before smashing into frozen fields around a sleeping Scottish town, because Gadaffi wanted to punish the West. Then I began to study the Middle East and islamic culture and theology in more detail, and was frankly horrified by what was accepted as a major world religion. The Pope understates the sheer crude nazism of many of the so-called prophet's teachings and actions; and the intimidating thuggishness of the masked protestors who greeted those attending Westminster Cathedral yesterday morning reminded me of nothing other than the Germany of the late 20s and early 30s. The media hide this truth, for reasons only they can know, so thank G-d for sites such as this, where we can find out the unsanitised truth of a war that our media are terrified to admit is even taking place. I'm sorry to hear about your friend, and can understand why you feel the way you do. It's important to remember that cameras only have "one eye" and we rely on the reporter to be the other, to provide the 'depth of field' on the story. The tunnel-vision or focus, or whatever metaphor you fancy to represent the Media's POV, will never be balanced, or objective, as it is slightly more difficult to 'soundbite' impartiality in the kind of time the mainstream media makes for stories like these (not to mention corporate agendas). If it wasn't for the 'Net much of what is reported simply wouldn't be - and the 'Net is finally starting to set the focus on SOME of the stories that should be reported (just watch a week of Sky News whilst reading news blogs for proof of this). So maybe, hopefully, if enough Muslims read what they're making of themselves in the eyes of the World they might just pause for a moment and think about the Truth long enough to stop threatening to kill everyone and start to realise that at least SOMETHING must be wrong with them when every rational person in the whole World has issues with them. Maybe. There's always Hope (unless you're one of the lucky one's living with a death warrant on your head issued by these 'Peaceful' animals! ).